ECLECTIC LIVING ROOM MAKEOVER REVEAL! 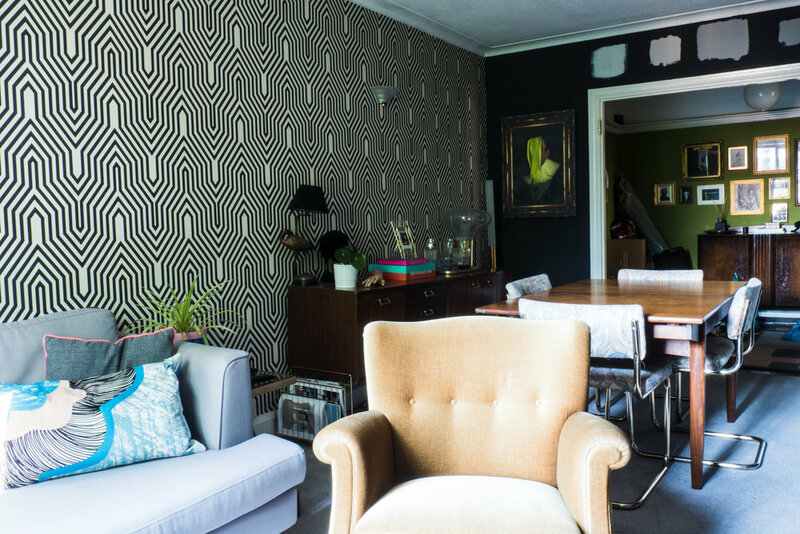 We have finally finished the eclectic living room makeover (well it's actually been finished for a while but we've been too busy to take pictures)! I'm pleased to finally share this with you and give you all the info on how we created this look and the suppliers we used. I actually didn't mind the room before, there was nothing particularly 'wrong' with it per se, it just needed a refresh to be in line with our current taste. You can see all of our thoughts and feelings about why we changed it and the moodboard we created in the planning post, here. I also had a feeling that the layout wasn't the best for this room, and after much convincing of hubby I got him to go for a new layout, which can be seen below. 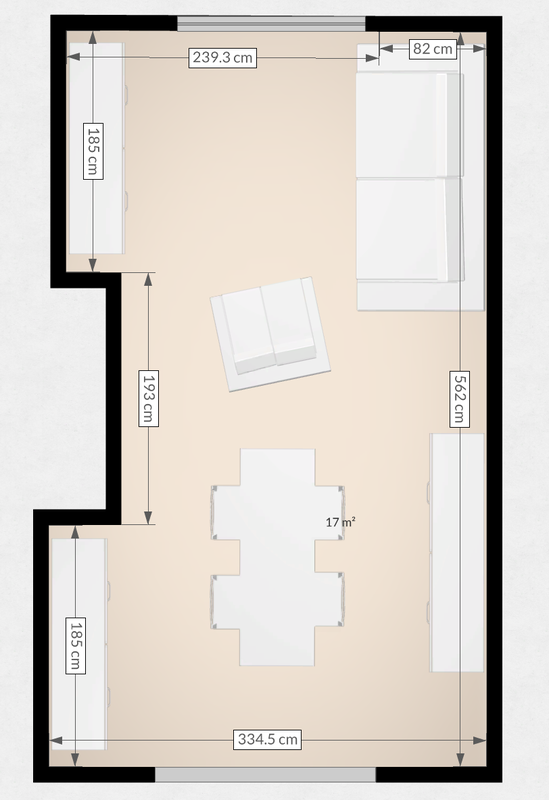 I use a free online tool called Roomle to mock up any floorplans and see how pieces will fit. I've worked with Crown paints a couple of times now and I'm always so impressed with their formula and colours. They're super easy to paint with (and no I'm not just saying that). 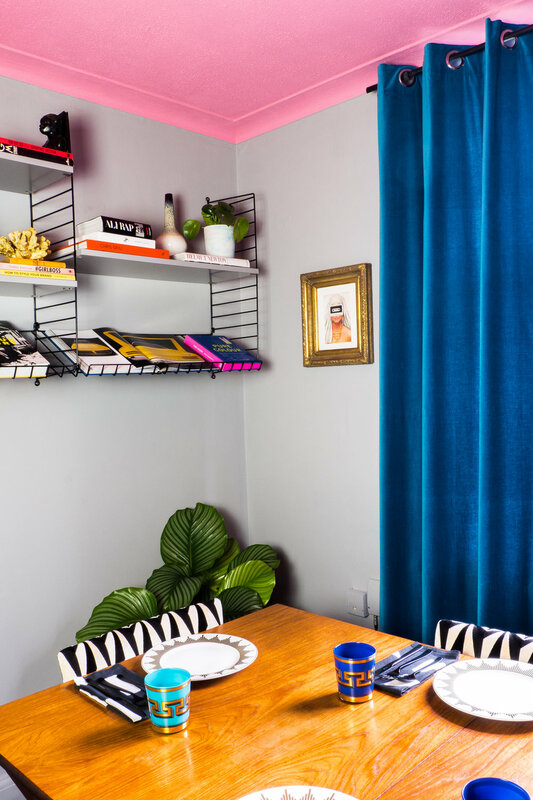 After doing a collab with them back at the start fo the year I fell in love with their Chatterbox pink feature wall colour and decided to do the whole ceiling in it for this makeover! I've also used Pencil Point for the mid grey wall finish. Who supplied the Eden sofa in Omega II Italian velvet in 'Azure'. This sofa is so cosy! It's got one joined seat which I think is a really nice detail, and the fabric.. oh the fabric! 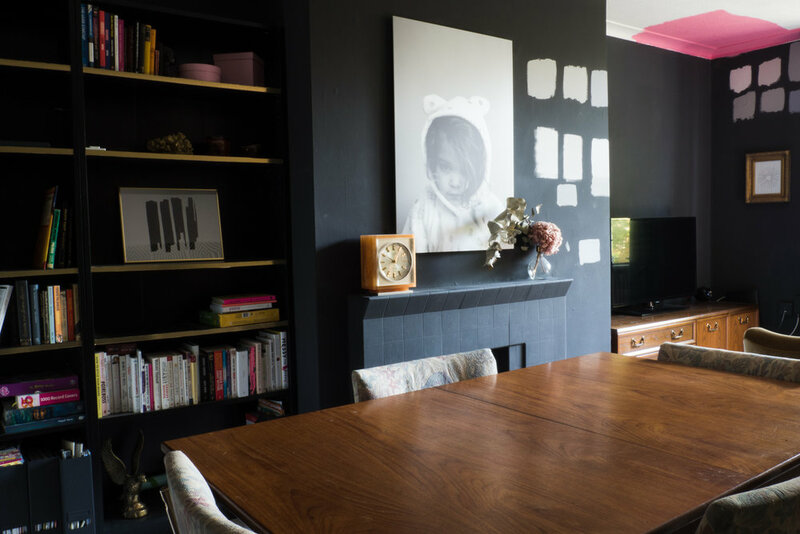 SO SOFT and such a stunning colour that offsets the pink ceiling and grey walls so well. Who supplied me a gorgeous majestic carpet in Polished Silver. It's like velvet! It looks and feel uber luxury, and this kind of carpet will last us YEARS. 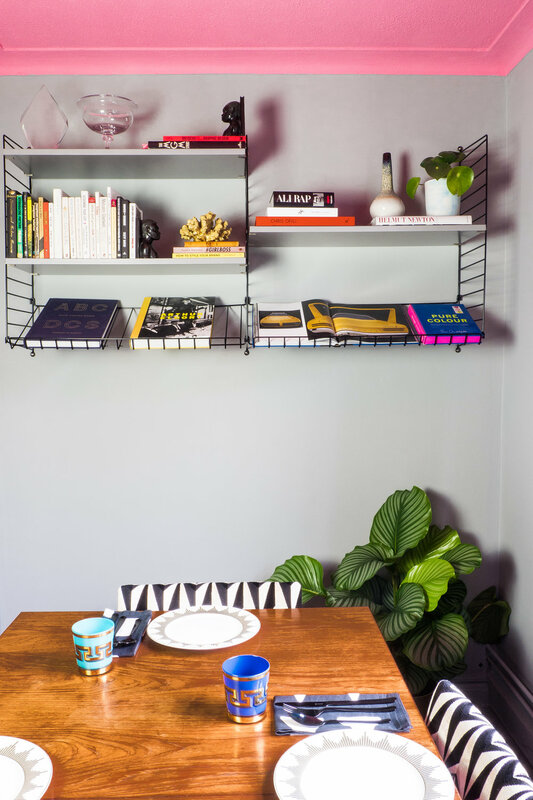 Who supplied a super cool shelving system that fitted perfectly into the little space we had in one corner of the room. Perfect for a curated display of books and ornaments - not quite the 'collection' we had before (aka, mess). I love the bottom shelf that is a magazine / book display. Who kindly supplied their Eley Kishimoto origami Rockets fabric for reupholstering my gorgeous 70s dining chairs. Who did such an outstanding job on transforming my old 70s brass cantilever dining chairs into something INCREDIBLE. These were wobbly, covered in Marley's kids stickers, the foam wasn't supportive anymore, and now... well just LOOK AT THEM! 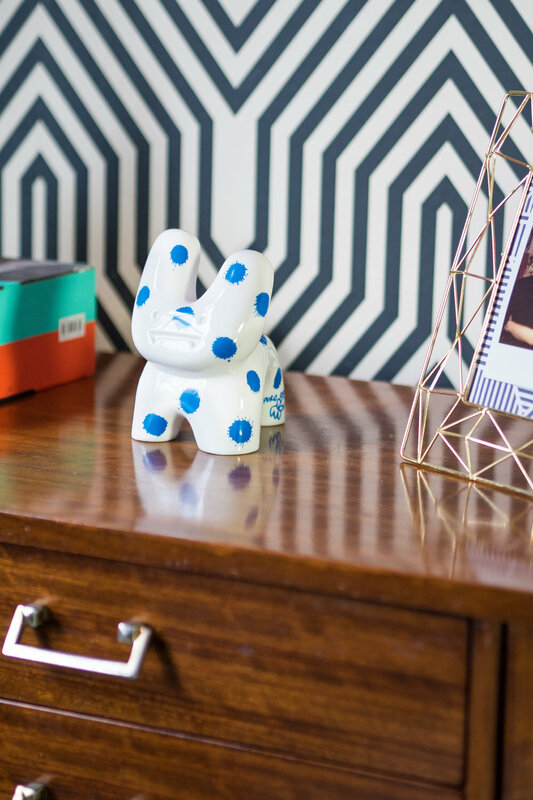 Who provided a few final bits and bobs to dress the space and make it feel fresh and new, like this Tom Dixon Bump vase, Jonathan Adler Glasses, cushion and Royal Doulton x Pure Evil bunny! So anyway... wanna see how it turned out?! We're so happy with how this has turned out, it feels so much more 'on brand' for us as a family and it feels much tighter as a scheme generally. 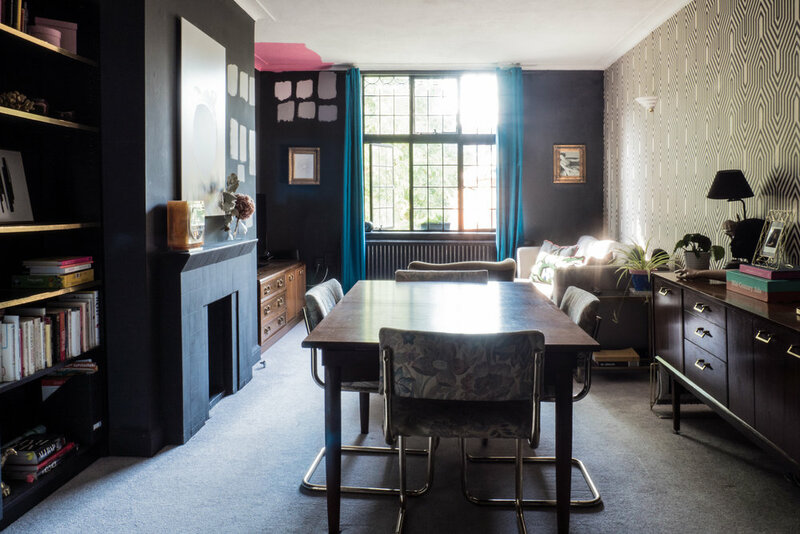 There were a few diversions from the original plan (like the mustard yellow curtains clashed with both the pink and the green armchair) but I think it's come together pretty well. Such a huge thankyou to all the brands that gifted product for this, it's such a fab place for us to hang out now. CHUFFED. If you have any questions about products used etc please leave a comment and I'll get back to you!